March’s Blog Contest: Counting Pills Win $30 Worth of Knock Knock Stuff! The most accurate guesser will win $30 worth of Knock Knock stuff. We had a few boxes full of rare Knock Knock Fucked Up Pill Erasers* lying around the office. 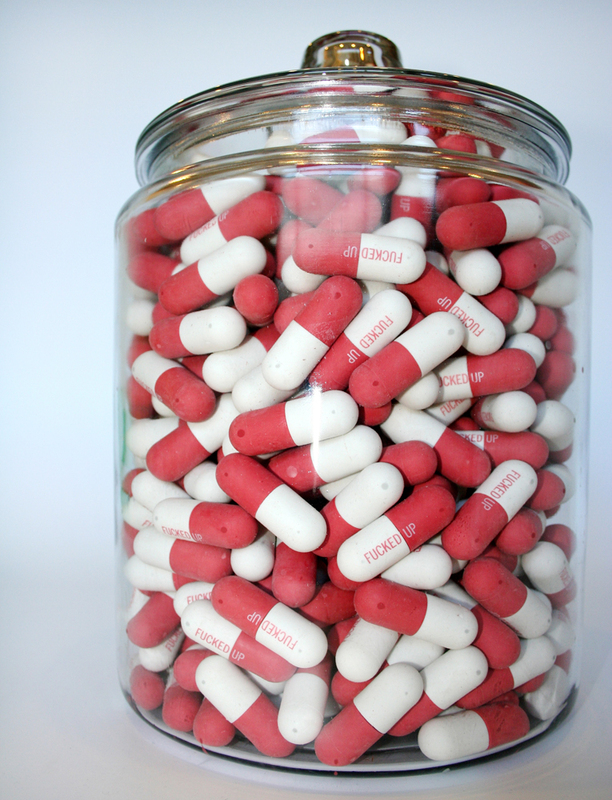 In an effort to give them purpose, we stashed the pills in a massive jar for this month’s blog contest. So, how many pills do you think are in this fine-looking jar? Tell us your guess and the person who’s the closest will receive $30 worth of Knock Knock stuff of their choice. We chose $30 since it’s the third month of the year. Imagine that. Post your guess in the comments section of this blog post or email blog@knockknockstuff.com with your answer by 6 p.m. on Tuesday, 3/20. Only one guess per person! If multiple people have the correct answer, the winner will be chosen at random. The winner will be announced at the end of March. May the odds be ever in your favor . . . and the even numbers too. *The story and mystique behind this defunct product is meant for a future blog post. But don’t fret, we’ll share it with you in due time.